Yup, embarrassed to admit it but the photo above is truly our medicine cabinet! I know I know, it is pretty darn scary. So when I received an email from the The American Recall Center asking me if I was interested in participating in the Medicine Cabinet Clean-Out Challenge, I decided to own up to my miserable looking cabinet of meds, and take them up on their offer. As you may already know I am also a registered nurse, and if I can have a medicine cabinet that looks like this, I am sure I am not alone So along with the questions The American Recall Center posed for me to think about while in the process of cleaning out this abominable mess, I also did a little of my own research for this post. OK let's start with some important questions. #1...Where is your medicine cabinet? 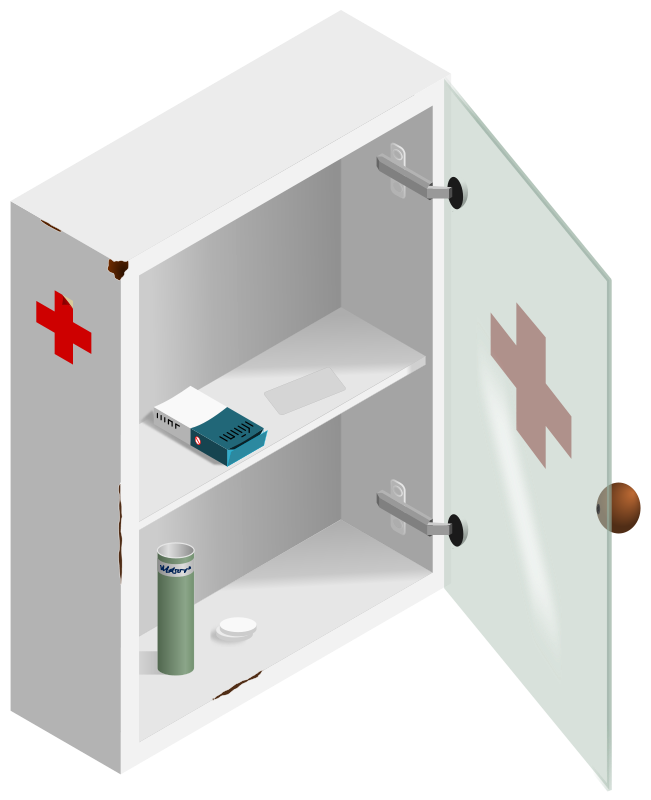 Cabinets containing meds should be in a secure place out of the reach of children, and in a temperature controlled environment. 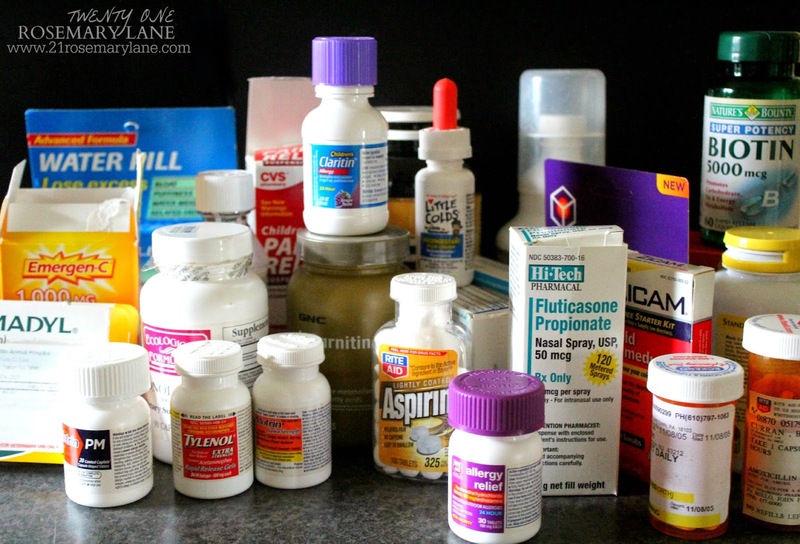 Meds exposed to light and moisture can become damaged, so it is best to keep medications in a dresser drawer or where I keep our meds, in a kitchen cabinet away from the stove, instead of in your bathroom cabinet. #2...How do you monitor your meds? Do you check to see if the the number of tablets or pills you took plus the amount left in the bottle, adds up to the original number of meds dispensed by your pharmacist? I can honestly say that I don't adopt this practice for the everyday OTC (over-the-counter) medications in my cabinet. However if I was prescribed any type narcotic, sedative, or sleep-aid, I would definitely make sure to keep a strict count. 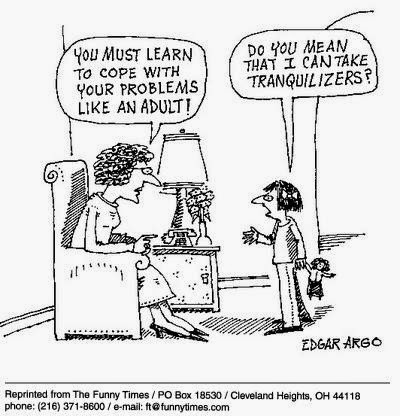 This is especially true with teens in the home as the risk of teen substance abuse is on the rise. #3...Have you checked expiration dates on meds? This may sound like a no-brainer but meds have dates to be used by and if they are taken after the expired date there is a good chance you are taking them for not. Once past the date of expiration many medications will start to lose their potency, therefore they are not going to work the way they should. Certain items such as Epi-Pens SHOULD NEVER be used after the expiration date. The drug epinephrine loses it potency after a period of time, and if one is in an emergency of anaphylaxis a less then optimal potency may result in a dangerous health threat. In addition certain eye drops which contain preservatives have expiration dates as well. This is because the preservatives help to keep the drops sterile. After expiration the drops may begin to grow bacteria which you do not want to drop into your eyes. Now I have now gone through my kitchen medicine cabinet, and boy oh boy was I ever surprised at the amount of expired medications we were hoarding. I am mortified to say that some of these meds expired as long ago as 2007! OK...so now what to do with all of these old medications? National Prescription Drug Take-Back Events. I did check and the closest drug disposal program near me is about 30 miles away. So what do you do in a case like mine? Well there are ways to safely dispose of unwanted medications at home. According to the FDA you can follow these guidelines for safe disposal. 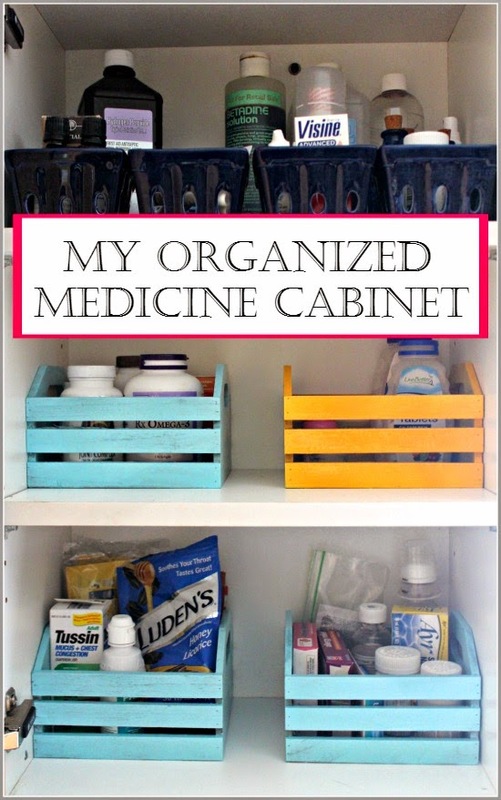 You are now ready to organize your cabinet!!! No silly not that cabinet!!! The best way to organize your meds is to physically separate them out using some sort of containers. I found little wood crates at my local Walmart for about $4 each, and then brightened them up with a little spray paint. But you can use baskets or see through plastic containers as well. If you are not using see through containers it is a great idea to label the outside of each container. Wipe down the bottles and the cabinet which they are being stored, of any sticky residue. Group together OTC meds by what they are used for. For example, keep your allergy and sinus medications in one basket or container, and tummy meds and the like in another. Organize meds according to usage. This is so the meds you use most often are together for easy access. Keep prescription meds and anything else that might temp your kiddies on a higher shelf, out of easy view and reach. So here is my streamlined medicine cabinet! Now that is quite a big difference don't you think? I also like to have an easy to read dosing chart handy. I created an ibuprofen dosing chart for you to copy and print out so you can tape it to the inside of your medicine cabinet for quick reference. 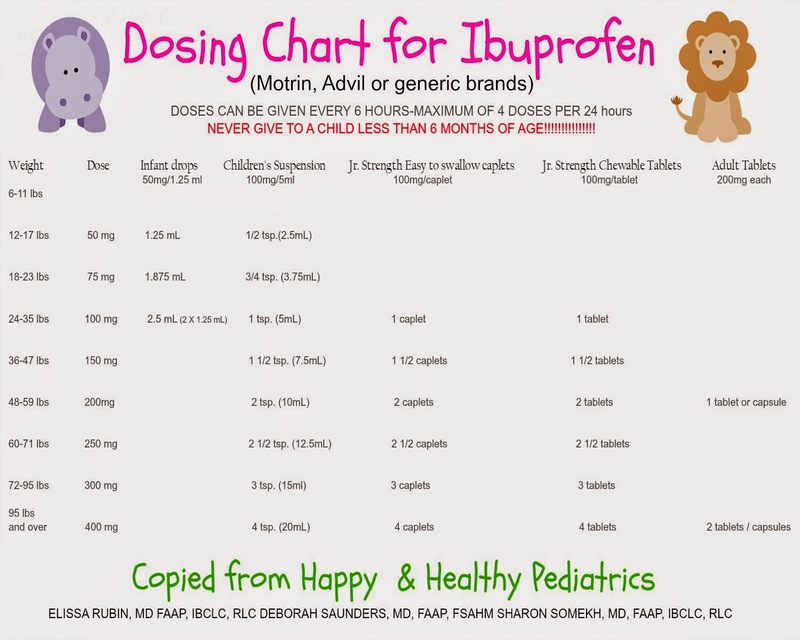 Just as an FYI...to treat children with fever it is safe to alternate ibuprofen with acetaminophen (Tylenol) every 3 hours. I can't tell you how happy I am to be rid of all of those expired meds taking up space in my kitchen cabinet. Now I can quickly access any medication I need without having to weed through a bevy of old meds and vitamins. I also made a quick trip to the drugstore to replace a few kiddie medications which had expired. 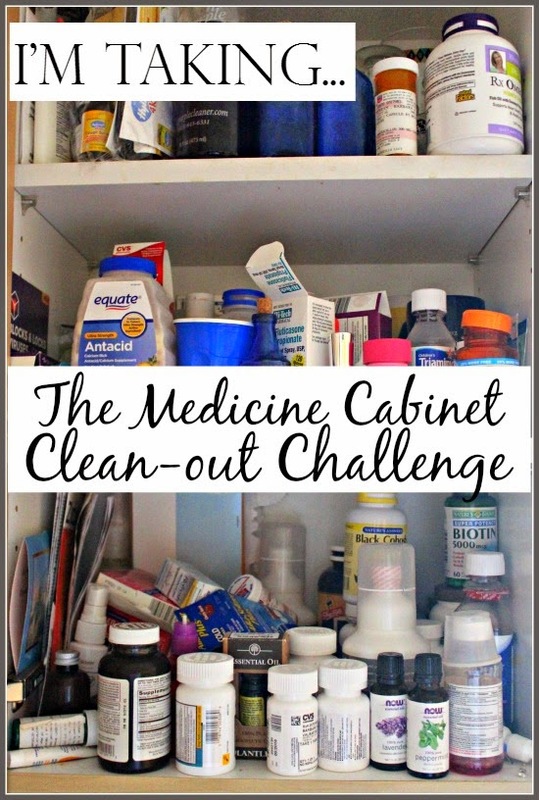 TAKE THE MEDICINE CABINET CLEAN-OUT CHALLENGE! And have a great weekend!!! To learn more about The American Recall Center you can go to their website. I like your idea of using those cute little crates, Barbara. I, also, keep our meds in a kitchen cabinet. But now, I want crates! Thanks for sharing. I just did this recently. I didn't know you were supposed to dispense with medication a certain way. I just tossed them in the trash. Well, now I know! Gosh, I've just been tossing my old meds in the trash. I do have my meds organized though and I don't have small children in the house anymore to worry about. Those are some good tips. Great post, Barbara! I am guilty of having expired meds and have also been known to even use them after the expiration date. I need to take the Expired Medication Challenge! Thanks for the wonderful information!